Freshen Up Your Plate & Lighten Up Your Waistline! It’s time to buckle down and freshen up your lifestyle after 6 weeks of holiday eating! Fish is a fantastic high quality protein that will easily fit into a healthy lifestyle. Our stores* are now offering a fast and fresh way to get fish into your diet without all the hassle of preparing it at home. What is it? Poke. 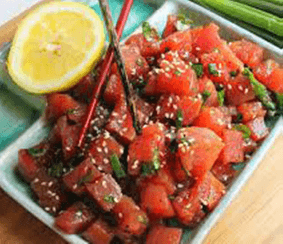 Poke appears in traditional Hawaiian appetizers and entrees combining cubed fresh fish and a marinade. Its versatility has increased and you’ll find it in recipe that include avocados and sesame, in ceviche, or served over noodles. How do I eat Poke? The American Heart Association® recommends eating fish twice per week for heart health! So give Poke a try as part of your overall fish consumption. *May not be available in all stores.